Maxi Moralez opened the scoring and NYCFC never looked back as they left Orlando with all three points. Orlando City SC: Edwards Jr.; PC, Schuler, O'Neill, Allen; Higuita (Rocha, min. 67), Johnson (Colmán, min. 82); Yotun, Kljestan, Mueller (Pinho, min. 71); Dwyer. New York City FC: Johnson; Sweat, Callens, Chanot, Tinnerholm; Ofori, Ring, Moralez (Berget, min. 86); Wallace (Lewis, min. 71), Medina, McNamara (Tajouri-Shradi, min. 62). SCORE: 0-1, min. 40, Moralez. 0-2, min. 45, Tinnerholm. On Thursday, Orlando City SC welcomed New York City FC to Orlando City Stadium for a clash of the 2015 MLS expansion clubs. 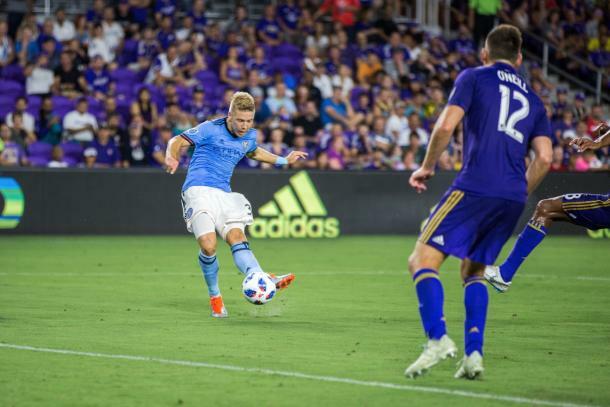 Orlando's struggles recently continued as they conceded two late goals in their last match to the Columbus Crew making them drop all three points while NYCFC are coming off of three consecutive wins. It was the first meeting between the respective managers as they both recently took over their club. Domènec Torrent held an impressive record of four wins and one loss since joining the league while James O'Connor had just one win from his first three, losing the other two. However, Thursday was a new day and both were hoping to improve their records in their young MLS managerial careers. NYCFC had the first big chance of the game as Maxi Moralez looked to capitalize on a slip from Chris Schuler. Instead, it was Earl Edwards Jr. who came up with two big saves on NYCFC's little magician. The next big chance didn't come until the 37th minute when Orlando came so close to breaking the deadlock. Sacha Kljestan laid the ball off to Yoshimar Yotún whose curling effort pinged off the crossbar and out of play. That missed opportunity came back to bite OCSC pretty quick as Maxi Moralez gave his side the lead in the 41st minute. To say the goal was scrappy is probably an understatement. PC's clearance bounced off of Rodney Wallace which found it's way on to the post leaving Edwards Jr. helpless as Moralez came in and put the ball into the roof of the net. It didn't take long for NYCFC to double their lead as Moralez was involved once again. On the brink of halftime, NYCFC's #10 found Anton Tinnerholm whose fake cross sent PC to the floor before "Tinnerboom" found the far post and scored his fourth of the season. It's the first time an NYCFC defender has ever scored four in a season, and this one gave his side some comfort heading into the break. The 58th minute saw Orlando come close to grabbing their first of the night. Some good play in the attacking third saw the ball fall to Rookie of the Year nominee, Chris Mueller, who seemed to have a clear chance. However, Thomas McNamara's tracking back allowed him to make a big tackle for his side. Orlando had an even bigger chance just minutes later as they continued to dominate for a spell of the game. In the 63rd minute, Sean Johnson came up with a big save when Dom Dwyer found himself alone in the box after a run between the defenders. 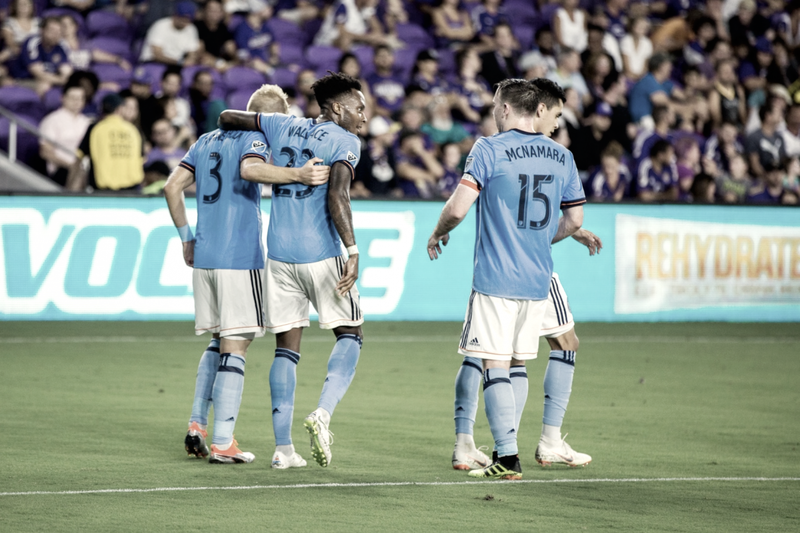 NYCFC thought they had a third after some lovely link-up play between Moralez, Jesus Medina, and recently introduced Jonathan Lewis, but after the ball found the back of the net, the Boys in Blue turned around to see that the offside flag was up. After the final whistle, the scoreline read 2-0 in favor of the visitors who make it four wins on the trot under their new manager while Orlando continues to struggle under theirs. New York City FC will return to action just three days after their match with Orlando. On the day, they'll be in the Emerald City to take on the Seattle Sounders. They'll continue playing Cascadia clubs the following week as they open up the month of August by hosting the Vancouver Whitecaps. Then, NYCFC head north of the border to take on Toronto FC at BMO Field. For Orlando, they'll also be in action soon after the NYCFC match as they take on the LA Galaxy on the West Coast. Then, they'll return home to host the New England Revolution before their first ever date at Audi Field as they face D.C. United.